It has long irritated me that NTNU - The Norwegian University of Science and Technology - doesn't offer ANY courses on Microsoft Technology whatsoever, at least as far as I know. We're only learning Java and other stuff, and .NET and C# are lucky to be mentioned at the end of a sentence. The foremost university in the country should take a look at the figures for which technologies are really used by software companies today. It is not my department, the Department of Computer and Information Science (IDI) that is responsible for the change, but the Department of Engineering Design and Materials! The first .NET course at NTNU is not hosted by the computer science people, but by the engineering design and materials people! Come on, IDI, take the hint! Look outside your own little Java sandbox. Guess who is holding the lectures! It's Rune Zakariassen from Microsoft, me and a friend of mine, Gøran, from Microsoft Student Community NTNU. That's pretty cool! The course is a preparation study for 5th year students starting on their diploma assignment, and consists of four seminars with lectures and hands-on labs. The first one was an introduction to .NET and C#. The second one, held this Wednesday was about Windows Communication Foundation (WCF), and the two next ones will be about Windows Workflow Foundation (WF) and real time communication. The idea behind the course is to give the students a superficial knowledge about these technologies so they can use them in their assignments. I'm still alive, but I've been so busy the last couple of months that I haven't had the time to update the blog. So here comes a blog post a bit longer than usual. So, let's take the first things first. 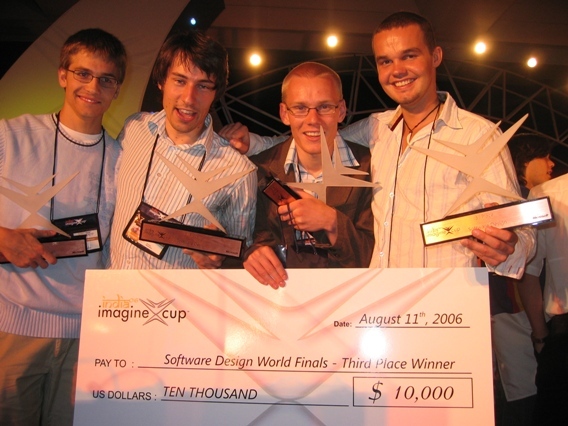 From the 4th to the 12th of August I had one week off from my internship at Microsoft to participate in the International finals of Imagine Cup 2006 in Agra and New Delhi, India, together with my team mates from Norway. I flew from Seattle to New York, had 20 minutes to get on the plane to New Delhi and then spent the next 14 hours on that plane. We actually flew right above Trondheim, the city where I study here in Norway. I took around 30 hours in total, and then add the 11,5 hours of time difference and staying up the first night in India to get our demo up and running, and you're there. Our team consists of four students from NTNU; Jan-Kristian (who is a FTE at MS now), Jonas, Gøran and me. We participated in the Software Design category, in which you are to come up with an idea on this year's Imagine Cup theme and design a software solution around this. The Software Design category consisted of three rounds. The first round was a 20 minute presentation where we presented our solution to the judges, and then 10 minutes with Q&A after wards. We held our presentation, and we thought it went pretty well, but we were still a bit surprised when we were selected to be among the 12 best teams that went to the second round. Now we were starting to think "maybe we're onto something here", and went for the second round presentation to do our best. As always, things didn't come together before the last moment. We stayed up all night before the first round to get our demo up and running, and when we got to the second round, we had to improve it a bit. So we were coding to the last moment. After the second round, things got even better when it was announced that we were among the six best teams, along with Denmark, Italy, Japan, China and Brazil. We were to present our solution to all the other contestants at the biggest conference center in New Delhi! The presentation went well, and we managed to answer the questions the judges came up with pretty well. Finally we ended up third, winning $10 000 and a trip to England in January! The trip was great; we got to see India and met a lot of other smart people with the same interests. The only showstopper was that I got sick a couple of days, probably because I ate some ice cream which I shouldn't have eaten. I missed a couple of things, the trip to Taj Mahal, among others. 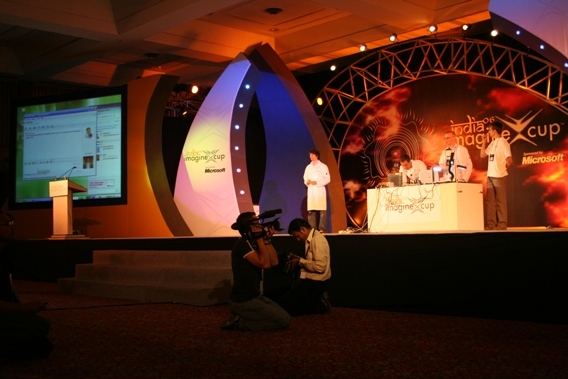 Thanks to all the people who made Imagine Cup 2006 possible and to all the participants for a great time in India! Us on stage in Delhi, presenting the MSN bot in our solution. When we got third place, we got a lot of publicity on many internet sites and in many newspapers. The number of results when you google my name has skyrocketed from about fifty to several hundred. http://www.f-b.no/apps/pbcs.dll/article?AID=/20060809/NYHET/60809012 Fredrikstad Blad: Til topps i Imagine Cup? I'll talk more about my internship at Microsoft in a later blog post. Create a new report in the report designer. Click some element, the report itself, for instance, and select Background Color: Expression in the properties window. Select "Custom", pick a color, red for instance, and double click it do put it into the expression window. Click OK and watch the report turn.... BLUE! It looks like the hex-formatted color string is reversed when it is inserted into the expression editor window. So where do I find the guys who wrote it, hmm. Was it out my office door, to the right and 50 meters straight ahead? Any of you tried that? Well, if you have, you probably encountered some interesting behavior. At least I did. I'm developing a web application here on the SQL Server Team @ Microsoft that needs to run in an application pool that runs with the identity of a domain user account. The application also uses Windows Integrated Authentication. For some reason I was not able to access the website from any other place than the local machine, even though I am an admin on the machine. I just kept getting login-boxes, which is equivalent to access denied. After three login attempts it resulted in "HTTP Error 401.1 - Unauthorized: Access is denied due to invalid credentials." When using Integrated Authentication, IIS is by default configured with two authentication methods: Negotiate (Kerberos) and NTLM, with Negotiate as the primary that is tried first. After burning off a few hours trying to figure this out, I found that in my setup, Kerberos authentication fails, and IIS will not let you access the web site. The same is also true if run the App Pool as a local user, and the server running IIS are not using a WINS or DNS name. It looks like the easiest solution is to disable Kerberos and force IIS to use NTLM. See the MS TechNet article below for how to do that. The blog link below describes another solution to this problem which may be preferable. As I wrote in my last post, I have a summer internship at Microsoft in Redmond, USA this summer. The same also applies to Vegard Andreas Larsen, also from Norway, studying at the same university as I do. As most of you probably have figured out from my last blog post, I’m at Microsoft’s headquarters in Redmond. I have a summer internship here this summer, and will be working here until the end of August. The whole story started in early March this spring. I applied for the internship through Microsoft Norway and sent in my resume. In end of March I went to Paris and was interviewed by three people from Microsoft in Redmond, one recruiter, one PM and one tester. I was asked to solve a programming problem about finding the lowest common parent of two nodes in a binary tree, and then to write the code to solve it on paper. I was also asked a brainteaser and to give examples on how I would test different things, like a table. Right before Easter I received a job offer as a Software Design Engineer in Test (SDET) on the WinFS team, so here I am. My first impression of Microsoft is that it is a huge company, and the main campus here in Redmond is quite large. The work environment here is very nice – everybody is nice and you don’t need to wear a suit at work – you can wear whatever you want. The campus is nice – nice buildings and lots of trees and vegetation – almost like a large park. As some of you may have noticed, WinFS has been cancelled as its own launch vehicle. What that means is that WinFS will not ship as a separate software component, but the technologies developed will be integrated into the next version of SQL Server and ADO. More information can be found on the WinFS Team Blog. I think is it a little sad that we won’t see WinFS shipped, but the vision of a richer storage in Windows is very much alive, as Quentin says. As WinFS will not be shipped, I will be put on another team, but more on that later. ...inside an Airbus A-340 300 with it's nose pointing towards south-west. I have to say that SAS' WiFi internet access on their intercontinental flights is a cool thing. Could have been faster response times (currently around 800 ms), but I guess that's how it is when you're surfing via satelite. "Office 12" BETA2 was released for public download earlier this week. I installed it earlier today, and haven't had any problems with it. I have to say that the user interface looks smooth! I especially liked the "SmartArt"-feature which enables you to create good-looking illustrations quickly.